It's nearly that time again, CHRISTMAS!! 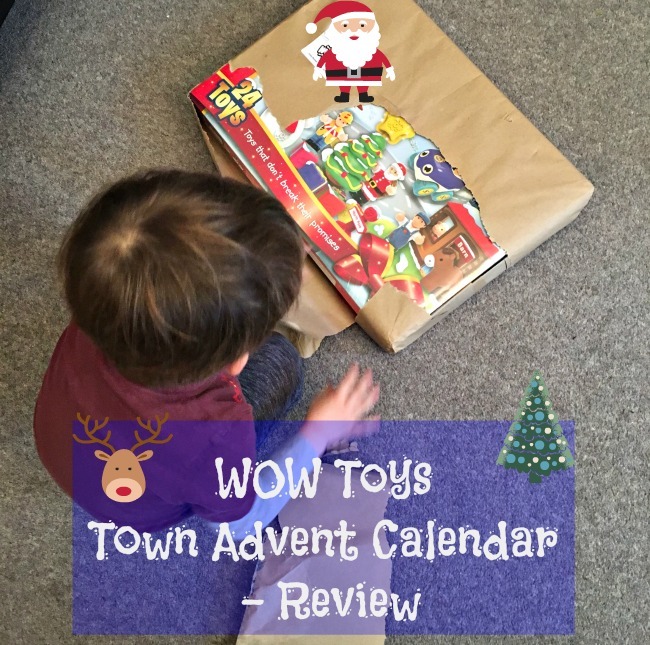 It wouldn't be Christmas without an advent calendar and one of our favourites is the WOW Toys Advent Calendar*. 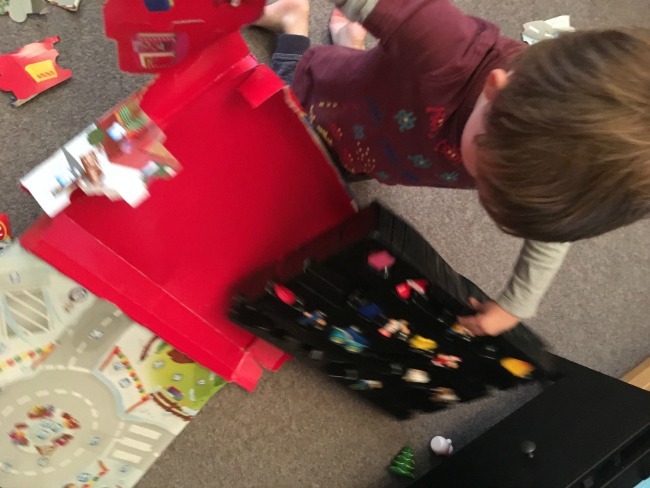 When Bear was one I bought him the WOW Toys Farmyard Advent calendar and he loved it. He didn't open a window a day, he opened them all and took them all out at once, but he was only one and quite adorable so I didn't mind at all. He still plays with the toys from it. 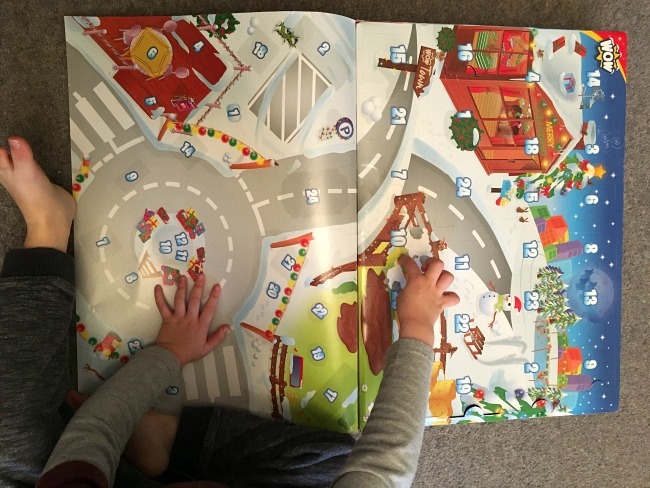 None are damaged or broken at all so we were really excited to be given a Town advent calendar to review. I had a plan, I set up the DSLR on a tripod to take still photos and had my phone ready to record him opening each window. I would write a review and every day in December I would put a short clip of the window opening on instastories. Good plan eh? Mmmm it didn't quite happen like that, what do they say? Never work with animals and children! Especially an excited three year old. So Bear waited, impatiently while I tried (and failed) to get a photo that was in focus. I couldn't make him wait any longer so explained that he had to open one window at a time, I would take a photo, and he could then play with the toys. He lifted the lid and gently prised the first window, even with encouragement to choose number 1 he chose 20. Then he didn't stop, he didn't pause, he just tore the top off until he could see some toys, pulled them out and then tore the rest off. Less than one minute and all 24 toys were exposed and half were out of the box. I couldn't film because I couldn't stop laughing, the photos I took were blurred for the same reason but his face! Bear was so happy he just loved it. Within minutes he had set up his own town and was pushing Bobby the Policeman around in his police car looking for "bad guys" (I know, sometimes I think Bear is more American than kids born in the US). "No! Where's the bad guy?" Bear shows me the police station and on it is a tiny, weeny picture of a mouse wearing a mask. "See Nanny" he points "Where's the bad guy?" he shrugs. I have no answer. There is no bad guy in the box. I explain that the policeman must have caught him and taken him to prison. Come on WOW Toys! 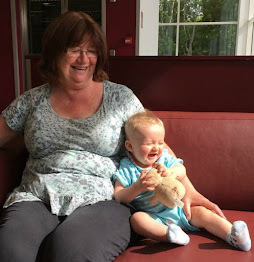 Help a Nanny out! We need a bad guy! "The snowman doesn't have a mouth" he says with another quizzical shrug and holds out the snowman for me to see. He's right, the snowman has no mouth. "How does he speak?" I ask, thinking I'll send that query straight back at him. He shrugs and comments something about how silly it is to not have a mouth but is soon back playing with the snowman helping the policeman catch bad guys. Do watch the video below, it's only 42 seconds long and is our box opening. 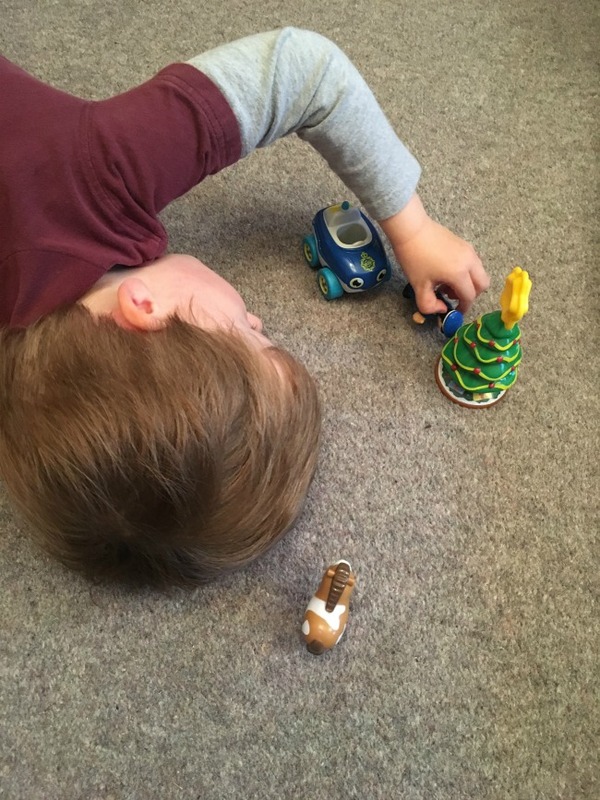 We love WOW Toys, they are well made and designed to be safe for little hands and mouths. Bear doesn't put the toys in his mouth anymore but if you look at the figures they have their arms out stretched. That is to make them too big to be a choke hazard, what a great idea. They are made from safe material, again designed for little ones that like to chew and do not need batteries, always a bonus. The box is designed to be used as a backdrop for the town, with a road and a plan to position each toy. Bear just ripped it off. The lid isn't stuck down to the base so it can be lifted as a sheet and the other days toys can be seen through the opened windows. If you have a child that will open one window a day then there are a couple of days where they may be a little disappointed. For example the Christmas tree comes in three parts. The base, the tree and a star. I can't see a child being excited to open a window and get the base of a tree. Buy one, we had so much fun and its not even November yet. 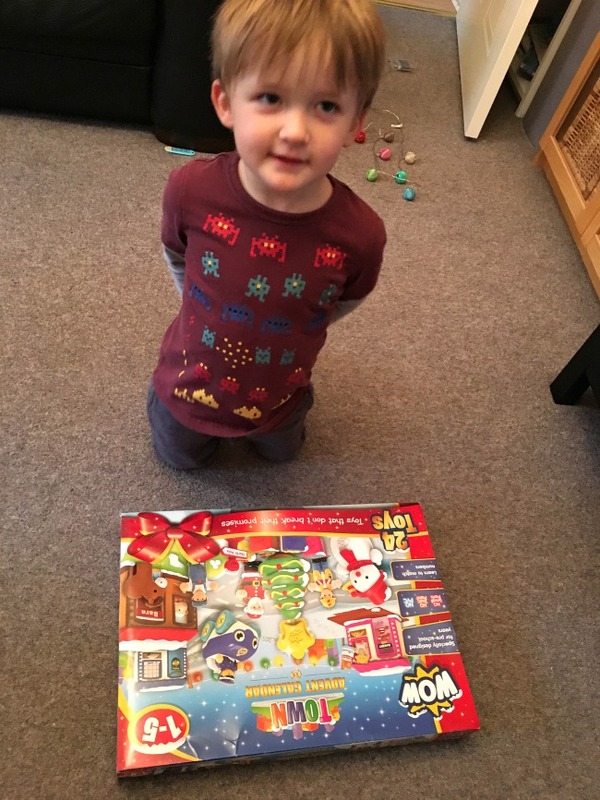 The WOW Toys Town Advent Calendar costs £24.99. I will be buying the Wonderland advent calendar and laughing again as I try to prevent a three year old from opening all the windows on December 1st. Have fun. 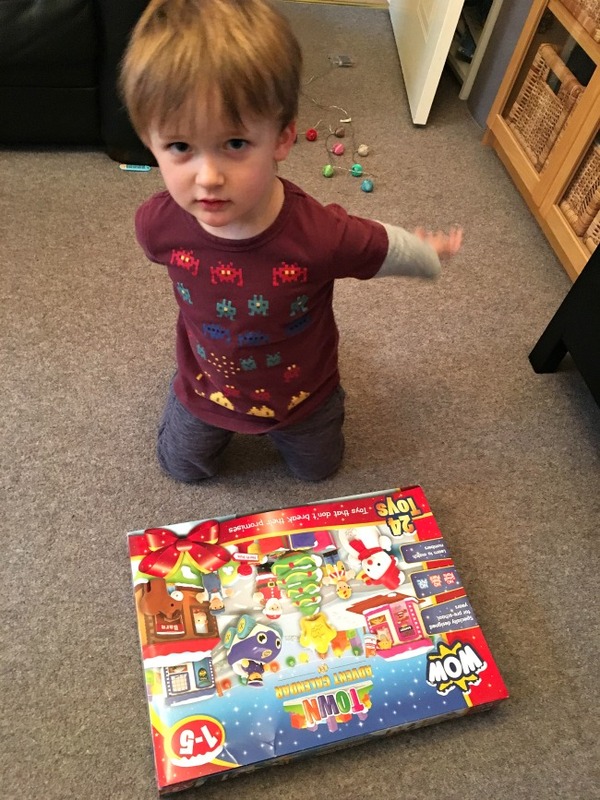 *Disclaimer - We were gifted the advent calendar for the purpose of this review. All opinions are honest and our own. Ooo we have the Town to review too although it is currently hid in the cupboard so I wonder how my two will cope with a door a day. Your post certainly made me laugh! I was mortified! There was just a pile of torn cardboard and toys. But he loved it, he is still playing with it and the one I bought 2 years ago he still plays with. I look forward to your review and hope you have more luck than me.